Painful Path To Fatherhood Inspires Poet's New Collection Douglas Kearney tells NPR's Rachel Martin about the anguish of miscarriages and the tough decisions presented by in vitro fertilization — experiences that inspired his latest book, Patter. 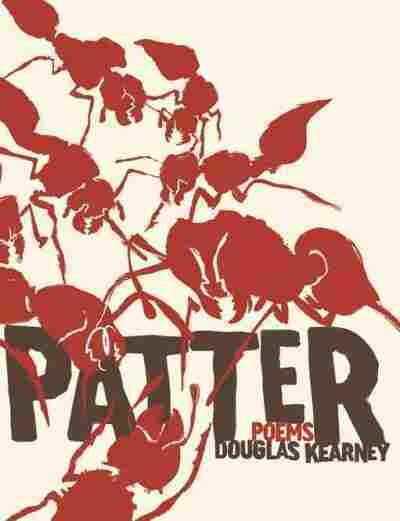 Douglas Kearney's new book of poetry, Patter, is not something you pick up casually. It demands a lot from its audience — one reviewer wrote that the book's readers must be "agile, adaptive, vigilant and tough." But the payoff is worth it. Kearney takes his readers into an extremely private struggle, shared with his wife: their attempt to conceive a child. The poems trace a journey through infertility, miscarriage, in vitro fertilization and, finally, fatherhood. The book's acknowledgements include an unusual note: "Thank you to the Mrs. Giles Whiting Foundation, whose generous award paid for the IVF procedure that made much of this book possible," Kearney writes. "We literally paid for the procedure with some of this prize money. You know, a lot of prizes and grants that artists and writers can receive, you actually have to produce something," Kearney tells NPR's Rachel Martin. "Not necessarily a child — or, in our case, two. But I wanted to acknowledge that here." Kearney and his wife spent eight years trying to conceive before they tried IVF; now, they're the parents of twins. The poet tells Martin about the emotionally complicated process of achieving fatherhood, and the heartbreaks along the way. I had family who'd been through a number of miscarriages. So I was expecting that there was going to be a certain level of difficulty — that it was going to be, you know, really an emotionally harrowing experience. But nothing actually prepares you for what it feels like to go through this. I mean, the miscarriage. ... I almost got into a fight at a drugstore the day we found out. It was just — it was just really difficult. And even when I was writing about it, I kept trying to write something that would feel like it. You know, I tried to make it so that I could write a poem that a reader would, would take in and they would go, 'Oh, my gosh, that's what that feels like.' And of course, all of those things failed because I ended up either magnifying it so much and then second-guessing myself and turning it into this sort of allegorical thing, or, you know, just completely underwriting it. And it was a very difficult process to deal with just from an emotional, psychological processing standpoint — let alone to try to make some art from it. two guys walk into a bar. first guy says "yo guy, why so down?" second guy replies, "my wife just had a miscarriage." first guy says "I know exactly how you feel, I just had my girl get an abortion!" I had two male friends, on two separate occasions, take me out after the miscarriage, and each one of them talked about a girlfriend. One had had his girlfriend get an abortion, and the other had been worried that she might be pregnant, but it hadn't taken. How are men supposed to talk about this? What are we supposed to say to each other when this happens? And so there was that, but there was also this real thing which is, how are men supposed to talk about this? What are we supposed to say to each other when this happens? And I didn't think of it ultimately as a purely gross miscalculation, it really was this attempt ... you just have to laugh about it later. I mean, this poem in particular took a while to get to because it was — there was a lot of anger, and that was what was coming out in those earlier versions of this poem. And I wanted it to be a little less like I was throwing these guys under the bus for really, actually, trying to help me, but we just didn't have the tools. With IVF, if you end up having a lot of eggs, the doctor will ... attempt to fertilize them all. And after you've had a success, you suddenly have to have this question of, 'What do we do with the other ones?' And there's not a rule of what you're supposed to do. I think that [the twins] should know a bit about what it took to bring them here. That they are special, you know, that we wanted them so badly — and here they are. You can hear Kearney read these poems, as well as "The Miscarriage: A Bar Joke," in the interview audio above. 1. stash scarlet silks in a lady's skirt. 2. plant her among the crowd. 3. call your shill to the dias. 4. lay her on your table. 5. conceal her with your bed sheet. 6. distract the crowd with patter. 7. apply a sleight between her thighs. 8. take hold the silk's loose corner. or let them thaw and spoil? Your teeth keen on silence? From Patter by Douglas Kearney. Copyright 2014 by Douglas Kearney. Excerpted by permission of Red Hen Press.